The Southern Coalition for Social Justice has conducted a review of the 318,644 registered North Carolina voters from the 2012 elections who did not have a valid, DMV issued photo ID that matched the name on their voter registration card  and found that, of all registered voters, NC women voters are disproportionately affected by virtually every part of the state’s new “Election Integrity” law. SCSJ has filed suit opposing North Carolina’s Voter ID law, and a separate suit challenging other aspects of NC’s new voter restriction law including limits to early voting, the end of provisional ballots for out-of-precinct voters, and the elimination of same-day voter registration. In both suits, SCSJ argues that the new law disproportionately affects people of color, the elderly, students, and the very poor. It has now become clear that women are also experiencing new obstacles to exercising their right to vote. Stories from other states show that strict voter ID measures are already disproportionately affecting women voters. Just last week, Texas Senator Wendy Davis was forced to sign an affidavit because her photo ID was not an exact match to her voter registration card. If North Carolina’s new photo ID requirement goes into effect in 2016, there will be no affidavit option – if a person’s photo ID is not deemed acceptable, that person will simply be turned away from the polls. And the people most likely to have those non-matching documents are women voters. According to a much-cited 2006 study by the Brennan Center for Justice, a third of all women have citizenship documents that do not match their current legal name. This can be the result of marriage or divorce, both of which overwhelmingly result in the possibility of a woman changing her name and a man’s name staying the same. 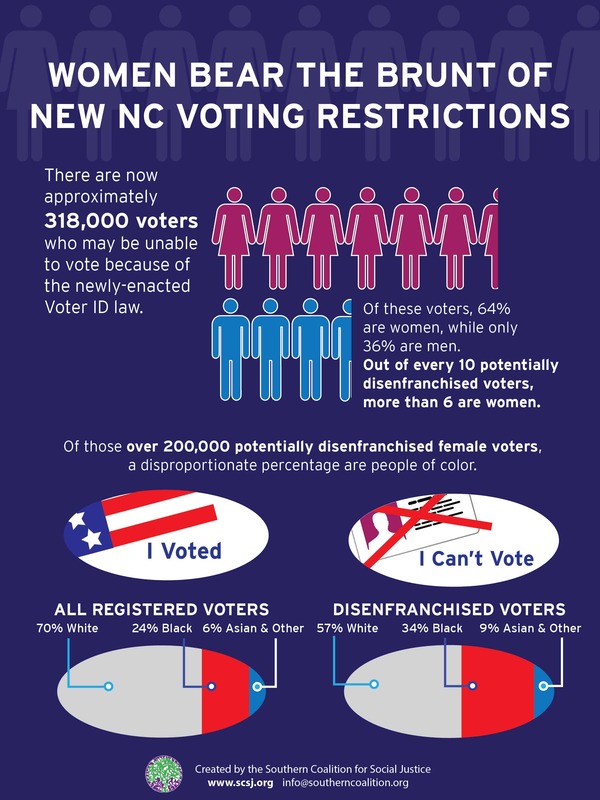 However, due to the broad reach of North Carolina’s new voting restrictions, SCSJ has found that women’s votes are being suppressed by many parts of the new law in addition to the voter ID requirement. Much like other studies of photo ID, SCSJ found that NC women voters are overrepresented among those who do not have a valid, DMV issued photo ID that matches the name on their voter registration card. Of the 3,575,713 registered women voters in 2012, 202,714 or 5.7% of registered women voters lack the identification necessary to vote. Meanwhile, of the 3,079,589 registered male voters in 2012, 115,930 or 3.8% lack necessary photo ID. 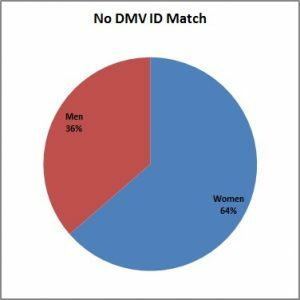 Another way of looking at the data is that nearly twice as many registered women voters lack the photo ID as similarly situated men. Of all registered voters lacking photo ID, 63.62% are women. New restrictions on one-stop early voting disproportionally affect all women, but particularly women of color. Women using one-stop early voting show voter suppression trends similar to those found with photo ID. 55.81% of one-stop early voters in the 2012 General Election were women. 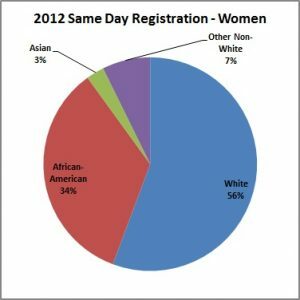 While African-American women made up 23.79% of total registered voters in 2012, they accounted for 31.69% of one-stop early voters. Interestingly, all non-white women appear to rely more heavily on one-stop early voting. While nonwhite women made up 29.52% of registered women voters in 2012, they made up 36.34% of one-stop early voters. The League of Women Voters of North Carolina is a named plaintiff in SCSJ’s voting rights lawsuits. LWV-NC President Jo Nicholas stated that “we are in the lawsuits because it is our mission to protect the voting rights of all North Carolinians. The discovery that women are disproportionately burdened by new voting restrictions increases the League’s commitment to fighting for voting rights for all North Carolinians,” added Nicholas. Some see the disparate impact on women voters as a major issue. “Voter suppression is a critical reproductive justice issue. Because of the new voter suppression laws, hundreds of thousands of women in North Carolina could be denied the right to express themselves on issues that directly impact their lives and their futures; these issues include the right to decide whether, when and with whom to have children,” added Suzanne Buckley, Executive Director of NARAL Pro-Choice North Carolina Foundation.